Home SEO What is IP address? And why IP address is so important? How are you? I hope all of you are fine. I’m also fine for your blessings. Greeting to everyone in the The Mental Club community. 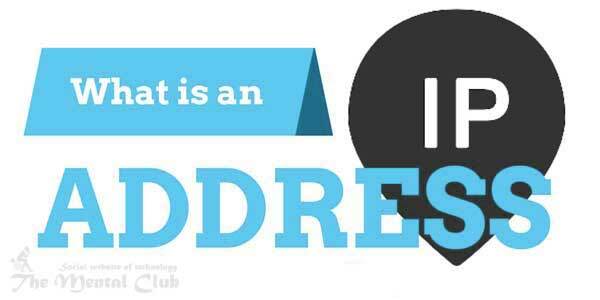 Today I will share with you “What is an IP address?”. There is no doubt you have heard many times that what IP address is. Until you will know what IP address is, actually how does it work or if you have dimmish concept then let’s know about this. What is an IP Address and What Makes Them So Important? 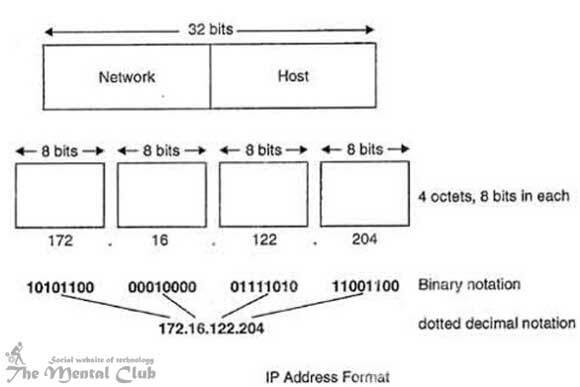 An IP address is a unique product of modern computer technology, which establishes connection, a computer with another digital device through internet. Where is their location, it is understood by IP address with internet by marking crore digital device. 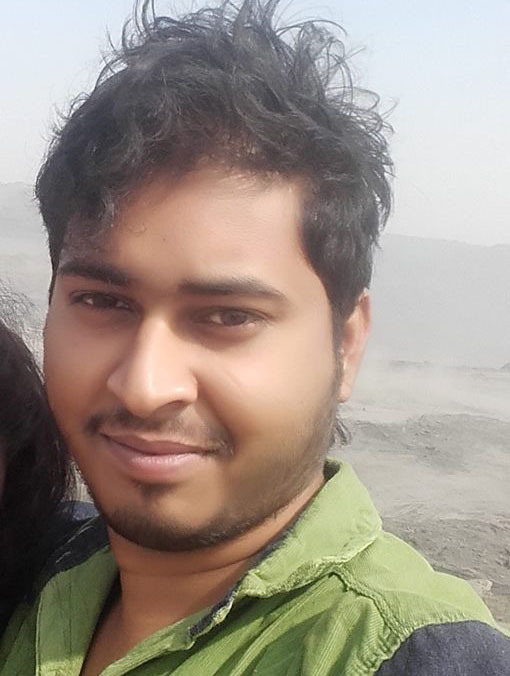 Like if someone wanted to send mail, mail address will need in the same word, IP address is necessary for the connection with a computer to a faraway computer. IP is internet protocol, so one IP address is the address of internet protocols. Its meaning is an “internet protocol address”. So one internet protocol address is for establishing connection in two devices through online, a media of exchanging data by marking the destination of two devices. Previous Article: How To Create High PR Backlinks? Click here to read all the tutorials about the SEO? 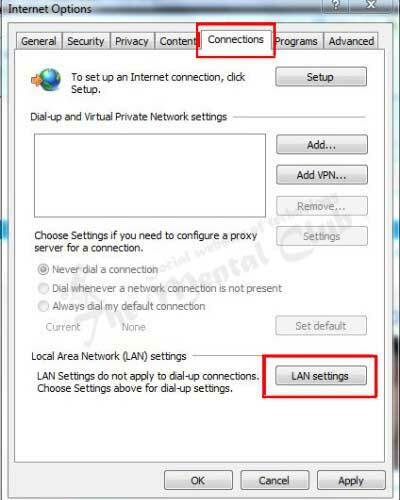 How to see the IP address? One IP address had four digits, in each 1 to 3 (those are called a set together) and there is dot (.) for separating digit’s set. There may be 0 to 255 in each four numbers. Here we see an example how to see the IP address 78.125.0.209. As a result of these four numbers masterly skills, we can contact very easily with each other through the internet, we can do many things including exchanging messages. It is impossible of exchanging data from side to another side through web without this numeric protocol. IP address may be static or dynamic. Static IP address never be changed. Static IP address is a simple and dependable way of connecting to faraway computer. Many websites those who give to internet users search of IP address and services at free of cost. If you want to know about your IP address, you can identify with a search in Google. Dynamic IP address is temporary, but the internet is used in computer for particular time. Static IP addresses are less in numbers because many IPSs share address among customers from static IP address. As a result, they can give service customers inexpensivesively. Those who want to play voice over internet protocol, identify others computers user very easily and establish connection with them, it is better to use Static IP address for them. Though using Dynamic IP Address in Dynamic DNS service, using a permanent or on time IP Address you can identify others computers users easily and establish connection with them. Check surely with an ISP that doesn’t take an additional charge. I think Static IP addresses are less secure than Dynamic IP addresses, because it is very easy to track these in case of data mining. If you use or lead internet correctly and you use which type of IP address, there is no possibility of device security problems like a computer or any other problem. They think that track is easy to data mining as static IP address is less secure than a dynamic IP address, then safe internet discussion can help for this possible problem and that is not the matter, keeping secure your computer for what type of IP you use. To use the internet, the computer has to stay a unique address which is called IP address. Through this IP address, that computer will be separated from other computers of the world. IP addresses are two types. Through “public IP addresses” we add in internet. And number of this public IP address is limited, and it is divided according to country and we have to pay money to get public IP. The main thing for saving from this problem is for saving money, each institution buys only one address not buying IP address for each computer. Then this IP address is set in a device like computer, router etc. And private or local IP address is set in all left computers. [You need to know one thing that these are used as a local IP address, 1. From 10.0.0.0 to 10.255.255.255, 2. From 172.16.0.0 to 172.31.255.255, 3. From 192.168.0.0 to 192.168.255.255]. Now all other PCs can’t connect in internet directly without a public IP address, as that has no public IP address. But they can connect to the internet through that public IP computer. The public IP computer will work as a medium in this case. And that public IP computer is called a proxy server. Example: Suppose, in which computer public computer has that name is a proxy server. And in which two computers private IP has their name is client 1 and client 2. Suppose now client 1 wants to see webpage at http://www.google.co.in. And now client 1 will inform its request server that it is wanting to see the webpage. The server will accept its request and webpage’s download will send to client 1. Remember at the time accepting server request from where the request has come, because from where request has come again answer has to send there. For anonymous totally local computer. Anybody will not understand from where it has come. For closing unwanted website in local network (in which way Facebook, YouTube are closed in office/ University). For seeing log report of internet. Like through a proxy it can be easily found out how much data is transferred. Without these many works can be done through proxy. But most of the proxy is the web proxy. Through web proxy it is possible becoming anonymous totally and hide own location. Anonymous is called where are users that will not be understood. Most of us know the name or use of proxy. We use proxy in many works. Let’s discuss a little bit about proxy. It can be started with a funny example. It is seen often in school or college that if someone is not present in the class, and at the time of calling roll number one friend of him gives present instead of him, it means he is present being not present. It is called class proxy. The concept of proxy on the internet is like that. Proxy are several types. Forward, dynamic, open and reserve. But mainly we will discuss about the use of the proxy. Its use is like that, you entered on a website from a page of script proxy, at first it will download all files of that script site in its temporary folder, and then it will send to you. This type of proxy is little bit slow comparatively, it becomes slow because of transferring data twice. In spite of that the possibility of missing data is more. The security of this type of proxy is less. It is totally useless and harmful for using any type of secure account. But you can use it in normal work. Even you can make it yourself if you want, it is not so hard. There is open source web proxy site which name is Glype, using which you can be a proud owner of a proxy site. Its work mainly you will be given an IP and port. Using that connection will work. We will not go into technical details, let’s see which way it has to use. At first we will need, an IP and port. For that you can visit this list. 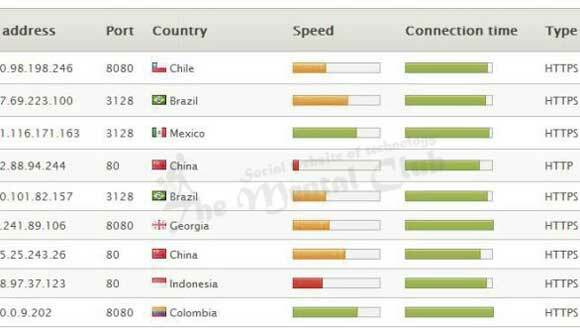 There are many IP proxy lists of many countries, various speeds, and various securities. From here select an IP and port, according to your wish. But note at the time of speed and connection. Now let’s know that process in which way IP Proxy is set. At first go to Options> Options > Advanced from the menu and there got to Network tab. Now click in connection settings. You will get a window, there select “Manual Proxy Configuration”. Then note in the following picture. Here give IP in the first box and port in the next box. As you are in basic stage, you don’t need to worry about SSL, FTP and sockets if you are not shopping in online (SSL), mostly in FTP software gives configuring proxy differently. So selecting “Use this proxy server for All Protocol” and then Ok. It will be same in the next menu. 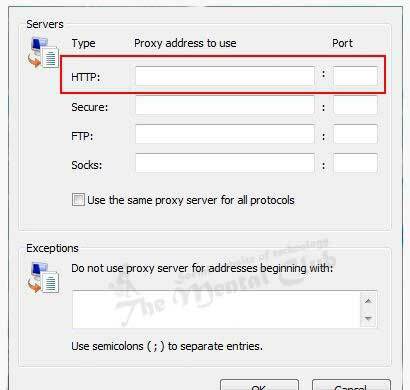 If everything is correct, then already you have leaded connection of Mozilla Firefox through proxy. Visit quickly from http://ip-address.org for test. See your IP has been seen. If you gave that new IP setup, then that shows so congratulations! 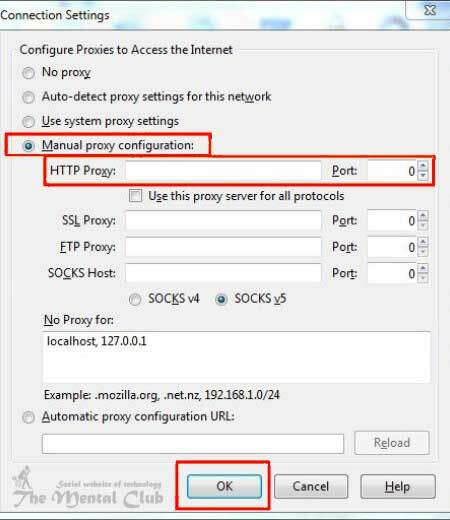 You have given proxy setup successfully in Mozilla Firefox. Go to Options > Under the hood > Network > Change proxy settings. I tell you before, Google Chrome doesn’t use any different proxy setting. Internet explorer uses its proxy settings. So you don’t need to do explorer’s settings differently of chrome and internet. And go to Tools > Internet options > Connections from internet explorer. Then see in the following picture for left setting. Go to red marked LAN setting from connection tab. Here active red marked checkbox and then click in advance. The rest part should not be a problem. Go to Opera Menu > Appearances > Preferences. Then go to the advanced tab. There select the network from menu of the left side. Then click on Proxy Servers from there. Then you have understood left part. Thank you for reading this article. I hope this tune will work for you. If there is any mistake, then forgive me. If you face any problem, then don’t forget to comment. If you think the article is beneficial then obviously share it. Stay with the The Mental Club for more information. What is Guest Posting? And what it’s advantages?